You can convert a vector layer to a bitmap layer, and you can convert a bitmap layer to a vector layer. If you convert a vector layer to a bitmap layer, the vector artwork will be rasterized into a bitmap image. Hence, the artwork will no longer be scalable and you will only be able to draw, paint or erase over it. Since bitmap layers have a canvas size and a pixel density, you will be prompted to choose the canvas size and pixel density of the layer when converting vector artwork to bitmap artwork. If you convert a bitmap layer to a vector layer, the bitmap artwork will be stored in a vector rectangle with a bitmap texture. This artwork will still technically be bitmap artwork, but any artwork you draw on that layer from that point on will be vector artwork. Select one or several bitmap layers. Right-click the selected layer and select Convert to Vector Layer. In the top menu, select Layer > Convert to Vector Layer. 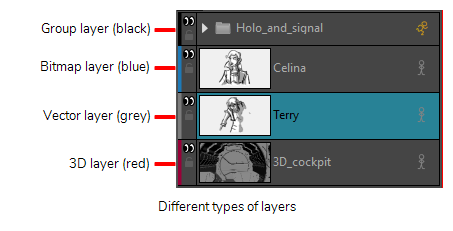 The layer is converted to a vector layer, as indicated by its colour in the layer list. Right-click the selected layer and select Convert to Bitmap Layer. In the top menu, select Layer > Convert to Bitmap Layer. If your layer was a vector layer, you will need to enter some parameters for the bitmap layer it will be converted to. The Choose Bitmap Layer resolution dialog appears. 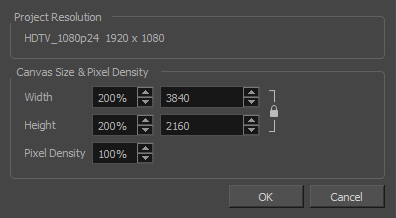 Select a canvas size and pixel density for the new bitmap layer and click OK. The layer is converted to a bitmap layer, as indicated by its colour in the layer list.